Four University of New Brunswick researchers are being hailed as among Canada’s top emerging innovators. The national not-for-profit organization Mitacs is saluting 150 researchers from all across Canada who it says are shaping the future of the country. The researchers highlighted represent various academic disciplines, and mirror Canada’s diversity and innovative spirit. The UNB innovators – Tanzina Huq, Arash Lashkari, Andrien Rackov and Babak Shirani – are involved in a variety of research fields from cybersecurity to early cancer detection. Dr. Andrien Rackov, a postdoctoral fellow in UNB’s department of chemistry, who is isolating chemicals in breath to determine an individual’s health. Partnering with the New Brunswick Research and Productivity Council, Dr. Rackov is creating a breathalyzer to make early detection for heart disease, lung cancer and other diseases easier and less intrusive. His research also includes the development of an “air sniffer” test to determine if a building has mould. Dr. Babak Shirani, who received a doctorate in chemical engineering from UNB in 2016, has research interests that include developing new technologies to purify natural gas to limit air pollution and protect the environment. 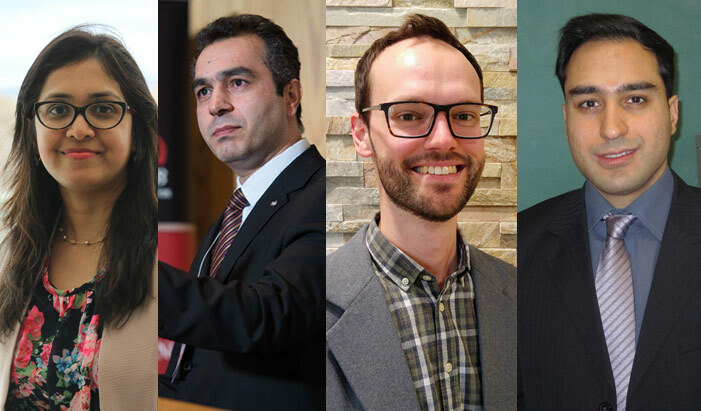 Photo: From left, UNB innovators Dr. Tanzina Huq, Dr. Arash Lashkari, Dr. Andrien Rackov and Dr. Babak Shirani have been named among the top emerging researchers in Canada by Mitacs.